The Muscle Car is one of the cornerstones of American automotive culture and the auto industry. These cars are notable for their high horsepower, twitch-inducing torque with engines that roar with an animalistic ferocity. But how did this come to be? When did the automotive history and culture go beyond race cars vs. consumer cars and where did “American Muscle” come from? In the late 40s and early 50s, American automakers were engaged in a very heated horsepower battle. Not just to meet the needs of professional racers, but to also deliver to the common people in post-war America. Shockingly, when the auto-industry hit the wall that was the limits of engineering and technology at the time, the average power of the typical passenger car had almost doubled. 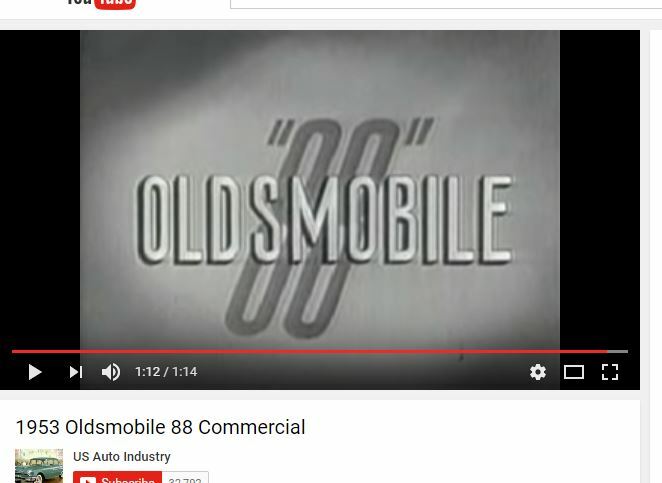 However it was Oldsmobile that got that going, with its advanced new overhead-valve V8 and the new mid-size model that shared its name: the 1949-1950 Oldsmobile Rocket 88. Oldsmobile’s first postwar engine was born during the union strike that shut down GM production from November 1945 through March 1946. During that period, Oldsmobile Motor Group designer Gilbert Burrell began working on concepts for new cars and engines. The design he was most fond of was, the idea of a 90-degree angle-positioned V8, which allows for a balance of power potential and physical size. After the designs were given to chief engineer Jack Wolfram and Oldsmobile general manager Sherrod Skinner, a new advance design group to develop a new overhead-valve (OHV) V8 engine was organized and work began. Since the advance design group envisioned an introduction for their new engine in the year 1949, the project was dubbed SV-49. The prototypes, which first ran in November 1946, were designed to take advantage of research that had been done by GM Research high-compression. The high-octane fuels necessary to take advantage of really high compression ratios were not available with the tech of the time so the displacement of the production engine increased. Road tests were conducted later that year and the new V8 went into production a few days before Christmas 1948. The new V8 was standard in the new 1949 Oldsmobile 98 before being refined for the 88. Oldsmobile V8s represented the start of several major trends in American engine design. Oldsmobile’s first OHV V8, dubbed the “Rocket” engine, was a large engine externally, but it was shorter and lower than the previous models and as a result it weighed quite a bit less. The Rocket 88 was capable of 0-60 mph (0-97 km/h) in a bit over 12 seconds and could reach an absolute top speed of 97 mph (156 km/h). Sure, some later competitors were a bit faster all-out and a few could beat the Olds off the line, but the 88 was a record breaker for America in 1949. The Rocket 88 would vacuum the chrome off V8 Fords (unless the Ford’s owner had made a substantial investment in aftermarket parts) and it took a semi-exotic, like the new Jaguar XK-120, to soundly beat it in a head to head. Although Oldsmobile’s official involvement in racing was limited, the Rocket 88 went to clean up in competition. NASCAR held nine Grand National races in 1949, of which stock Rocket 88s won six. The following year, 88s won 10 out of 19 Grand National races and set a new speed record at Daytona. An 88 also won the first grueling Carrera Panamericana, the 2,176-mile (3,500-km) Mexican Road Race. (Ten of the thirteen 88s that entered that race managed to finish, which is itself an impressive feat). 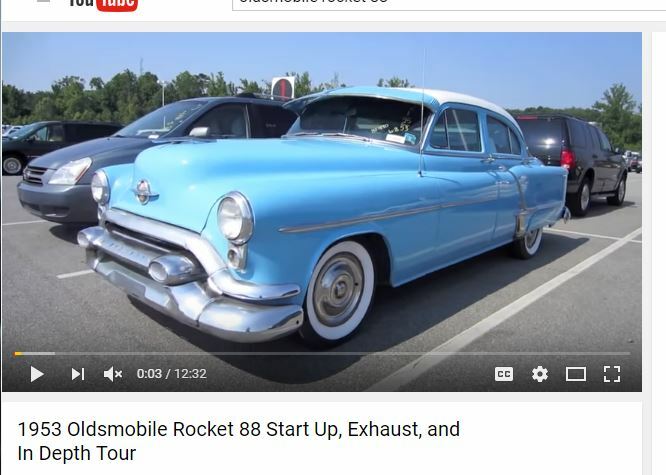 More-or-less, stock Rocket 88s continued winning their classes at the drag strip well into the 1950s.The Car was an icon that even had song named after it. In fact, “Rocket 88” by Jackie Brenston and his Delta Cats is even considered the 1st ever Rock & Roll record. It’s fitting since the Rocket 88 is considered by motorists to be the first true American Muscle car. Inevitably, the 88 overshadowed Oldsmobile’s cheaper 76, which still used a 257 cu. in. (4,213 cc) L-head six. Any interest in better fuel economy was quickly forgotten; gasoline was cheap and speed sold more cars than cost-cutting. The 76 lingered for one more model year and then was dropped entirely; the division wouldn’t offer a six again until 1964. Oldsmobile may now be synonymous with old-timey sedans and luxury cars but they should be remembered as one of the pioneers of American muscle cars. The Rocket 88 is the great grandfather of that particular brand of engineering and it literally paved the road for successors with the innovation the that brought US auto scene to what it is today.